Chromebooks are functionally like laptops, and yet they're not. So when you're planning a Chromebook training, teachers need some time to explore their differences in order to feel comfortable using them. In planning our 3-day "Integrate-to-Inspire" Chromebook Institute for this summer, we decided to let teachers collaboratively ferret out the idiosyncrasies of the Chromebook on their own. We also wanted it to be engaging, since this was going to be the first activity on the first day. 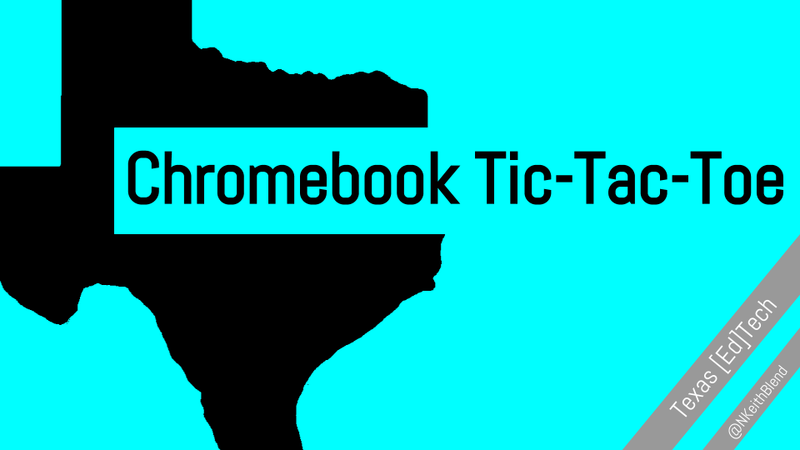 And so was born Chromebook Tic-Tac-Toe. 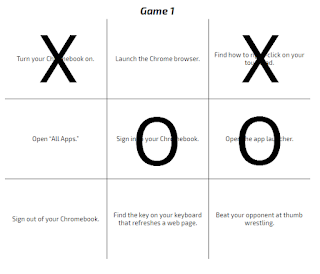 Chromebook Tic-Tac-Toe is played just like regular Tic-Tac-Toe: two players get their Chromebooks and one game board, then they decide who will be X's and who will be O's. To take a space on the board, they have to demonstrate on their Chromebook how to do the task is in that space. In the example below, X took the top-left square by turning their Chromebook on. Then O got the middle by signing in to their Chromebook. X then took the top-right square by finding how to right-click on a Chromebook, then O captured the middle-right by opening the app launcher. It's part ice-breaker, part learning, so it gets people talking and working together. It encourages participants to look up what they don't know (I politely refuse to give answers while they're playing and instead ask them how they would find the answer if I wasn't there). They remember what they learned later because they had fun doing it. They start learning to be self-sufficient and solving problems on their own. 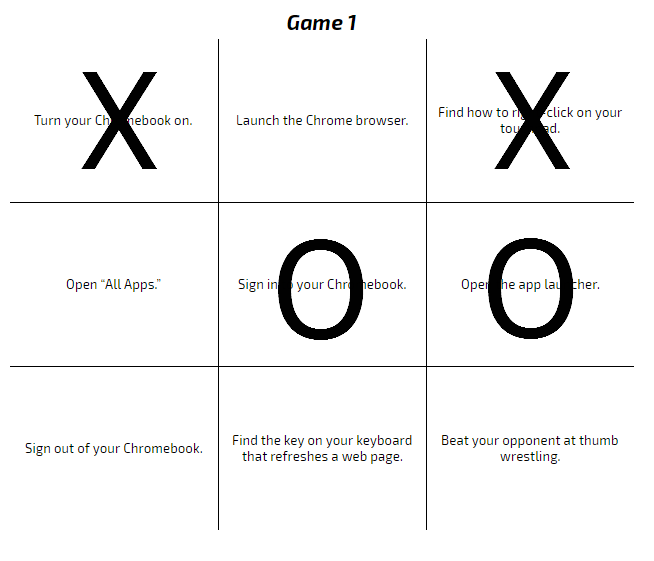 You can get a copy of Chromebook Tic-Tac-Toe by following the link below. There are three games, and each one increases slightly in difficulty. Depending on the ability level of your group, it takes from 30-45 minutes to get through all three boards. Have fun!